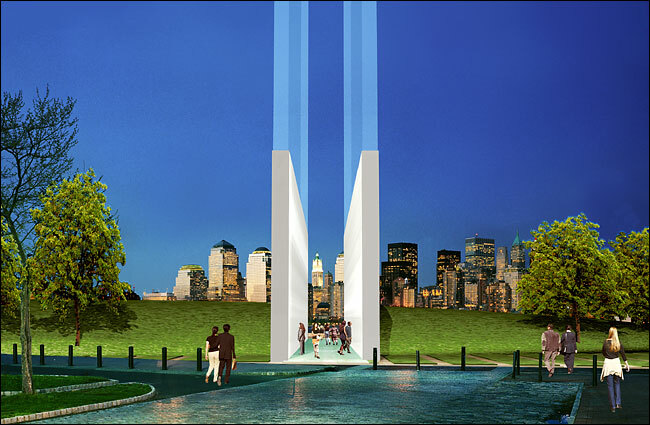 Frederic Schwartz's winning design for the New Jersey 9/11 Memorial in Liberty State Park. The winning design for a Sept. 11 memorial in Liberty State Park in Jersey City features two stainless-steel walls and beams of light. A design featuring two stainless-steel walls that look from a certain perspective as if the World Trade Center towers had been neatly felled and had landed in New Jersey has won the competition for New Jersey's Sept. 11 memorial, Gov. James E. McGreevey announced yesterday. The winning proposal came from the Manhattan-based architect Frederic Schwartz. 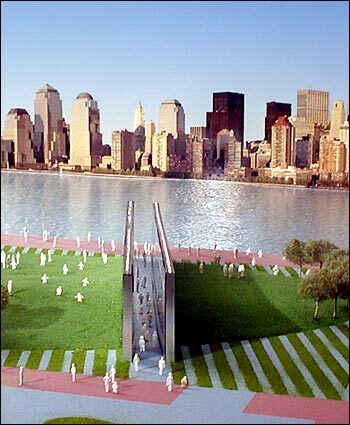 The design for the memorial, which is to be built directly across the Hudson River from ground zero at Liberty State Park in Jersey City, was the unanimous choice of a panel that represented the families of the nearly 700 New Jersey victims of the Sept. 11 attacks, officials said. Mr. Schwartz's memorial, "Empty Sky," is reminiscent of Maya Lin's Vietnam War memorial in Washington. It has two facing walls of brushed stainless steel with the names of each New Jersey victim engraved on them. As Mr. Schwartz's firm put it: "Individuals' names are within easy reach and engraved deep enough for hand rubbing. The lettering size is three and three-quarter inches high, in Times New Roman, a familiar and easy-to-read typeface." Each wall will be 30 feet high and 200 feet long, as long as each World Trade Center tower was wide. The walls' proportions will be the same as those of the twin towers if they were lying on their sides. And the surfaces of the steel walls will reflect the changing light of day, as the towers once did. At night the memorial will be illuminated so beams of light shoot into the sky. Between the walls will be a walkway of bluestone. And at the base of each wall will be a space for visitors to leave tributes to the dead. The plan calls for the wall to cut across a grassy knoll in Liberty State Park, tracing a sightline that looks directly across the river to where the towers once stood. In the park that surrounds the walls, groves of dogwood will be planted to shelter two beams taken from the wreckage of the World Trade Center. And violets, which are New Jersey's state flower, will bloom. Mr. Schwartz said yesterday in a telephone interview that he planned the memorial to be "powerful, and it should be, to reflect the magnificent people who died." Nikki Stern, the executive director of Families of September 11, a national advocacy group, acted as an adviser to the New Jersey families. She said that the design "captured a lot of the themes that were laid out by the families group." It pays tribute to those who died at the World Trade Center, the Pentagon and in western Pennsylvania, where one of the planes hijacked on Sept. 11, 2001, crashed. It frames the Manhattan skyline, it alludes to the World Trade Center, and it can be seen from New York and New Jersey. "It is a real beacon," she said. Ms. Stern, whose husband, Jim Potorti, died in the north tower of the World Trade Center, said the families also felt it resonated emotionally. "All the names are there, and you can touch and see them," she said. This memorial, she noted, will be different from the one planned for the World Trade Center site in that it will be above ground and the families of the victims chose the design. The winning entry was selected from 320 proposals in a two-part process. First a jury of design professionals nominated a group of finalists. Then the members of the families and survivors' council selected the winning design. Mr. Schwartz, who worked with a Massachusetts-based architect, Jessica Jamroz, on "Empty Sky," was a member of the architecture team Think, which was a finalist in the competition to design a plan for the World Trade Center site. His firm, Frederic Schwartz Architects, is also designing the Westchester County Sept. 11 memorial, "The Rising," a sculpture of steel rods to be completed by Sept. 11, 2005, at Kensico Dam Plaza, a county park in Valhalla. He said that "this space will be different from any other." 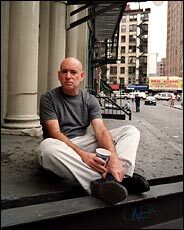 In New Jersey, he said, he was able to do what he had wanted to do in Manhattan: create a void for contemplation. "I look up from my desk out my window," he said. "It was filled with the World Trade Center, and now the sky is empty." Frederic Schwartz says he hopes his Sept. 11 memorial reflects "the magnificent people who died." I wonder how the memorial with the lights will be seen from New York at night. I wonder how the memorial with the lights will be seen from New York at night. Didn't even know that there was a New Jersey 9/11 memorial competition too. I like this one a lot. Very good choice. This isn't the same project that Tsereteli's design was being considered for, is it? This is NJ state's memorial, and Tsereteli's is for Jersey City - is that right? That's right; here is the thread for the Jersey City 9/11 memorial. NEWARK, June 30 - Gov. James E. McGreevey unveiled on Wednesday the winning design of the state's official Sept. 11 memorial, featuring two walls of brushed stainless steel that will face ground zero from Liberty State Park in Jersey City. The memorial, entitled "Empty Sky," will stand 30 feet high and extend for 200 feet. Walking between the steel walls in the northwest corner of the park, visitors will be face to face with the names of more than 700 New Jersey victims of the World Trade Center attack, engraved in nearly four-inch-high letters. The memorial was designed by Fredric Schwartz, a New York architect who also created the official Sept. 11 memorial for Westchester County. At an unveiling ceremony at the New Jersey Performing Arts Center in Newark, Mr. Schwartz, who entered several other competitions, said he was grateful that his model was chosen from the 360 bids received by the state. "Each memorial I designed was different," Mr. Schwartz said, "but each is the same, because it is a monument for family and friends who lost a loved one on that terrible day." The walkway of the memorial walls will be lined up perfectly with the space in between where the towers once stood. Mr. Schwartz said the planned Freedom Tower at ground zero would not encroach on his memorial's intended view of the empty sky. A 12-member jury comprised of victims' family members unanimously chose Mr. Schwartz's design. The memorial will be open to the public 24 hours a day and will send two beams of light into the night sky every night. "Our goal was to provide a memorial that enshrined the best nature of those lives," Mr. McGreevey said. "Also, to teach the next generation the blessings of our country and of the loss of that day." State officials were also quick to point out that this design was not related to a controversial memorial featuring a teardrop suspended in a 10-story bronze tower, also planned to adorn the Jersey City waterfront. Mr. Schwartz's design will be set in a large field on the banks of the Hudson River and will be surrounded by dogwood trees and violets, the state flower. "The design really represents our families, all families and the state," said one juror, Victor Santillan, 28, of Parsippany, who lost his sister, Maria Santillan, in the 2001 attack. Mr. McGreevey said the memorial will cost about $7 million and will be financed through private donations and state funds. It is unclear when developers will break ground or when work will be completed. Another juror, Betsy Parks of Bayonne, whose brother Robert Emmett Parks Jr., died in the attack, was drawn to the symbolism of the memorial. "It is going to be huge, just like the towers. The names will be large, just like the people who died," she said. "It will be open and lit up every day just like the trade center was. It was the perfect design in our minds." the Vietnam memorial is very simple but has a profound effect on those who visit it. Its not really how the memorial looks that gives it its importance but, what it expresses and its effect on those who visit it.As of beauty of the memorial in my opinion, its good. Reminds me of the vietnam memorial though. I do wonder what is going to be the national 9/11 memorial if there is going to be any wich there should be already proposals for washington d.c. This is a seperate monument than the one proposed for the Bayonne piers. Liberty State Park is in Jersey City . . . Bayonne piers, to those of you blinkered by the 5 boroughs, would be in Bayonne which is to the south of Jersey City. The monument is mostly good - it is monumental in size, has a certain quality of reserved statement, it is non-representational, and would make a good addition to the Liberty State Park waterfront. And, as a cooridor of two columns aimed directly at the downtown skyline, it perfectly fits with a quintessential Jersey attitude about Manhattan's loss - the WTC defined the skyline from that angle (seen from Hudson county, seen from the highway overpass), it WAS, in a sense the city. So, a monument devoted to lost lives, which recreates that view in such a sombre way as this seems fully appropriate. On the downside, this design is so clearly and blantantly derivative of the Vietnam Veterans memorial. names printed on walls, a non-representational monument, a monument which is landscaped so that it is PART of the landscape, a architectural intervention which points to a scar in the culture's collective consciousness. I wonder what Maya Lin is thinking right now . . .
Secondly, and more importantly, it does not seem that these plans take into account the dramatic change that will occur in the downtown skyline when the freedom tower and other WTC towers are rebuilt. How, for instance, will the two vertical lines which the monument puts into our view of the skyline at some distance interact with the new tallest building in downtown manhattan. This monument seeks to recreate (through illusion and only from a certain angle, of course) the old view of two twin towers; and this is at odds with the whole project of the freedom tower, which is to create a new tower which bears some relation to the old (in height, in footprint, in location), while not duplicating it. I am not convinced that the visual effect this monument will have, will be quite as successful once the freedom tower is built. Estryker, the angle that it points to was developed with the current plan for the Freedom Tower and surrounding buildings and non of the other buildings will be in that corridor. As work begins on the state's 9/11 memorial in Liberty State Park, an advocacy group is taking aim at state officials for approving a design that blocks views of the Manhattan skyline. "The state of New Jersey should already have had a public meeting at Liberty State Park on the design of the 9/11 memorial, which blocks the historic view of New York City," said Sam Pesin, president of Friends of Liberty State Park. The memorial - called "Empty Sky" - features two 30-foot high and 200-foot long stainless steel walls perched on a 10-foot high grassy knoll. It has been nearly two years since family members of those who died on Sept. 11 chose the winning design - which was selected out of a field of 320 entries - and preliminary landscape and site-preparation work is nearly complete on the giant mound. But Pesin said it's still not too late to scrap the design and go back to the drawing board. "The public, who uses the park, deserves a role," he said. Tom Vincz, a spokesman for the Department of the Treasury, which is overseeing construction of the memorial, said the department has received requests made by Friends of Liberty State Park and has forwarded them to the Department of Environmental Protection for review. Preparation work is expected to be completed this week. The state will then seek bids for construction of the memorial. Why not make the walls transparent? Would'nt it serve the same purpose? Glass walls would be symbolic of democracy and can be illuminated at night and not block views of the surroundings. EMPTY SKY, OR EMPTY VIEW? New Jersey's planned 9/11 memorial in Liberty State Park is designed to embrace the panorama of Lower Manhattan and Ground Zero, but critics, including the mayor of Jersey City, say the tribute will ruin the view. "It destroys a natural attraction and a beautiful vista," said Mayor Jerramiah Healy, who recently asked Gov. Jon Corzine of Hoboken to consider a different spot in the park for the memorial. Jersey City officials have been barraged with calls from residents since crews started dumping soil in the northeastern corner of the park several months ago, Healy said. State officials say the mound, which is now 14 to 20 feet high, will be compacted into a rolling knoll up to 10 feet high in some places. Two stainless-steel walls will rise from it, 30 feet high and 200 feet long, bearing the names of the more than 700 New Jersey residents who died in the terrorist attacks of Sept. 11, 2001. Some contend the memorial will be too big and will mar the view of Lower Manhattan from parts of the park. Some say the modern design will clash with the historic landmarks in the vicinity, including the Central Railroad of New Jersey Train Terminal, which dates back to 1889. Sam Pesin, president of the 800-member volunteer group Friends of Liberty State Park, likens the view of Manhattan from the waterfront park to a "national shrine." "We feel there should be a public meeting, and we want the hill design revised," Pesin said. "Certainly everyone understands the tremendous pain that the victims' families have, but this is an issue of democracy and a memorial that's going to last generations." The memorial's design is meant to incorporate the sweeping view, said Lisa Jackson, commissioner of the state Department of Environmental Protection, which is overseeing the project. The memorial is called Empty Sky, and its walls, set 16 feet apart, are meant to create a visual corridor focusing on the void where the World Trade Center's Twin Towers stood across the Hudson River. Last week, Jersey City Planning Director Robert Cotter sent a letter to Jackson saying under state law the DEP should have asked the city Planning Board to review the proposal before beginning work. P.N. :This I'am against. Let it get built. You have a whole another 1,121 acres to get a view. This just absurd. Build it already. ALso you are allowed to walk up the lil' 10 ft mound and go in front of the memorial to get the view. The onyl way this messes it up is if you are standing right behind the damm monument, otherwise you can see it jsut fine. UGH!! I will be at the meeting to express how I feel! Despite opposition from local lawmakers and residents, Gov. Jon Corzine says he wants the state's 9/11 memorial at Liberty State Park to go ahead as planned. But the president of the volunteer Friends of Liberty State Park said he would file a lawsuit to prevent the construction of "Empty Sky" as planned. Corzine, who met Wednesday with Hudson County lawmakers to discuss the controversial project, declared he wholeheartedly supports "Empty Sky" as it was drawn up. The memorial will consist of two 30-foot high, 200-foot long stainless steel walls inscribed with the names of more than 700 state residents killed in the terrorist attacks. The memorial would sit on a 10-foot high hill on the park's waterfront next to the historic Central Railroad of New Jersey train terminal. The proposed memorial has drawn opposition from the Friends of Liberty State Park and others who say it would block the spectacular views of Manhattan, the Statue of Liberty and New York harbor. Sam Pesin, president of Friends of Liberty State Park, called the memorial a "massive monstrosity" and said the governor was making a "colossal mistake" by supporting it despite the opposition of the park's users. "This decision shows total disregard for the democratic process, Liberty State Park, and the people who use it," he said, adding his organization would file a lawsuit later this month to try to block the project from going forward. "I thought that once he read about the sensible reasons for the opposition, he would realize how right it would be to relocate the memorial. I really am surprised and extremely disappointed," Pesin said. "This is like a slap in the face to the Statue of Liberty." Assemblyman Lou Manzo, D-Jersey City, who has said he's in favor of a 9/11 memorial but in another location so as not to obscure the view, expressed disappointment with Corzine's endorsement. The unobstructed views of where the Twin Towers once stood, Manzo said, would be the "most fitting way to remember the victims of Sept. 11." He suggested the memorial be placed alongside the park's Grove of Remembrance, also dedicated to the state's victims of 9/11, which is along the cobblestone road (Audrey Zapp Drive). Manzo, Pesin and others also have complained about the lack of public input in the process. Though "orientation meetings" were held during the open submission stage of the memorial design in which 350 proposals were submitted, once the six final designs were chosen by a jury of 12 family members of 9/11 victims, there were no further public hearings until the final design was announced. Elaine Makatura, a spokeswoman for the state Department of Environmental Protection, which is overseeing the project, welcomed the governor's support. "It's been five long years and we need to remember the residents of New Jersey who died on this tragic day," she said. Asked whether enough public hearings were held to discuss the placement of the memorial, Makatura said she "didn't want to rehash old issues," but that "this has been an open process all along." how historic is a view that's only been there since they filled in dumps and the old train tracks. The people that are complaining should go look at the view from anywhere else along the NJ side of the river. There's still another 20 miles of the view for them.